Everybody knew Stella. Even if one had only lived in the village a few months you would have noticed this little blond lady striding purposefully towards somewhere. And that was the thing about Stella-everything she did had purpose, and as a result the Parish of Winsham benefited enormously from the forty or so years during which she lived among us. Stella arrived with four young children. At the memorial service held at St.Stephen's on Monday, 29th February, they all gave touching accounts, through Tim Price ,who conducted the service, of the love and care Stella gave to them during their early life in Winsham, and despite being short of money, how their lives were full of love, fun and activity. As the children grew up, Stella became more active in the community. She was our District Councillor for many years, representing the Liberal Democrats, and was strong on 'green' issues. She also served at various times on village committees, including the Jubilee Hall Management Committee. However, it will be for her drama productions , in association with the Winsham Players, that she is most likely to be remembered. Over a twenty five year period she successfully staged some sixteen drama events, most of which she wrote herself. Three of the largest productions were classics, 'Pilgrim's Progress', 'Canterbury Tales' and 'Under the Greenwood Tree', and were major outdoor events, requiring large casts and a great deal of organisation. 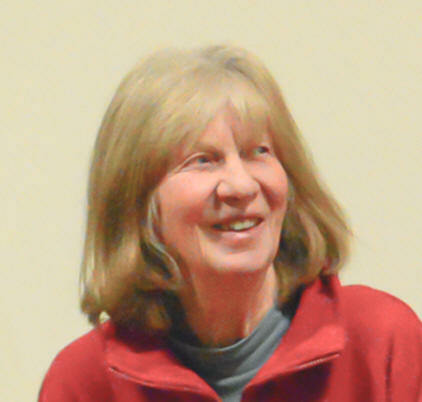 Her last production was at the Winsham Parish Council's 120th Anniversary in December 2014, which she wrote herself, and in which she traced the history of the Parish Council since it was formed in 1894. Entitled 'Plus ça change' it was based around actual Parish Council minutes. With a mixture of humour and poignancy she demonstrated that although the years go by, nothing much changes! A remarkable piece of work. Stella was a lovely person. She was feisty, certainly, and had an uncompromising integrity, but she was also forgiving, open minded and generous in both a material sense and in her attitude to people. Winsham has lost a wonderful character.